These eats go back a while. The first was way back in April on ANZAC day – the bear and I met up with my mum and dad for lunch and a movie due to it being a public holiday. We met in between our places on Chapel St, and headed towards the Sweetwater Inn for a bite to eat. Unfortunately, they weren’t yet open when we got there, though that may be a good thing – this post may have had far too much deep-fried-ness otherwise. Yowzers! I’ve never really spent a lot of time on the South Yarra end of Chapel st – it’s a bit more fashion-oriented than I can bear for very long. They do have a couple of cinemas though, and plenty of cafes and restaurants to drink cawfee and fill tummies. We decided to stop at a Mexican place called Amigos, as it wasn’t too far from where we needed to be. Amigos has three location – South Yarra, St Kilda and the CBD, and according to the website they have been serving Mexican food and drink since 1981. Upon viewing the menu, I noticed two items labelled vegan. Not a huge choice, but good to have the options labelled nevertheless. 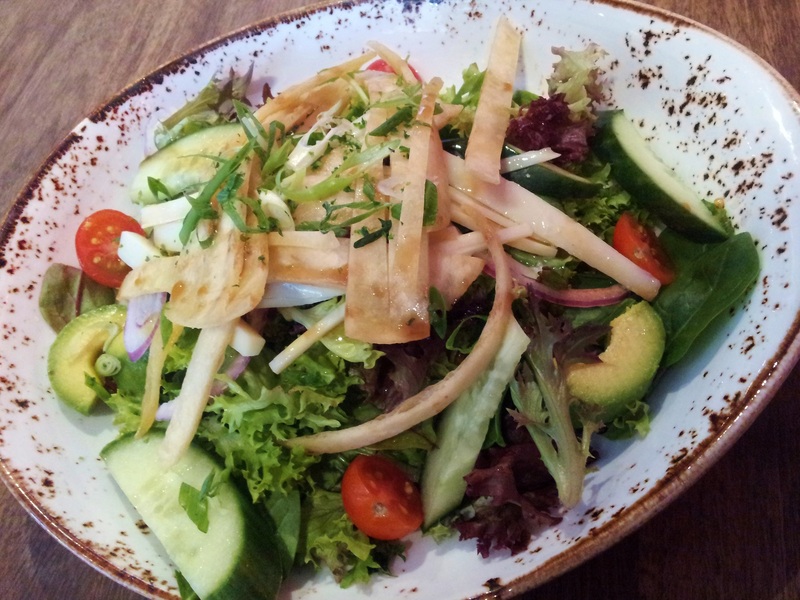 The bear went for the Ensalada Verde – a green salad with avo, tomato, red onion, and a citrus and herb dressing, topped with tortilla strips. He enjoyed this, and even let me taste a little. Decent tasting though someone overpriced at $16.50 for some leaves and bread, in my humble opinion. 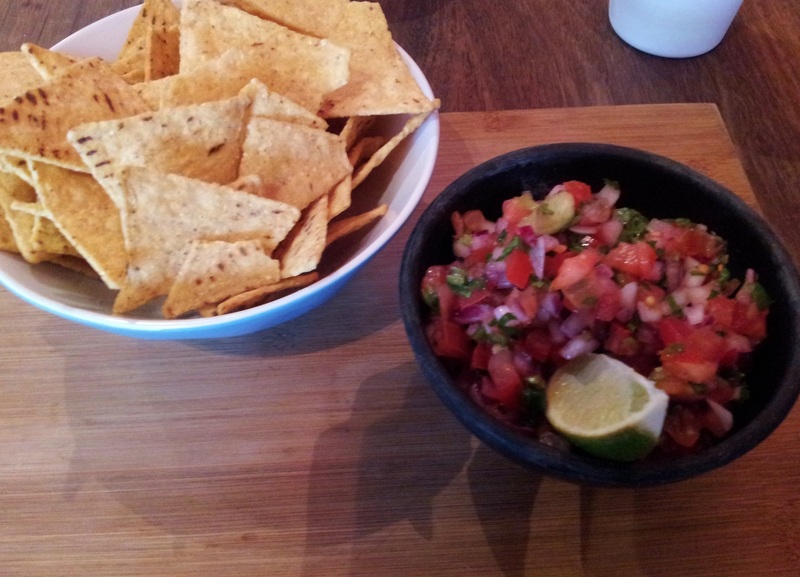 I had the Pico de Gallo – a blend of tomato, red onion, coriander, lime and chili with corn chips ($10.50). Nice and fresh tasting, and suits my love of snacking foods. Afterwards, we went on the Jam Factory to see The Grand Budapest Hotel at the cinema. It was the first time I had been to the movies in quite some time, and I enjoyed watching a film in the dark on the big screen. Gotta love Wes Anderson, I enjoyed the unusual darkness of this film, as well as the usual quirky patterns of conversation. Since then, I’ve been to the cinemas two more times (Good Vibrations and All This Mayem) and am looking forward to more visits – hopefully I’ll catch a few films at the Melbourne International Film Festival starting tomorrow….look out! 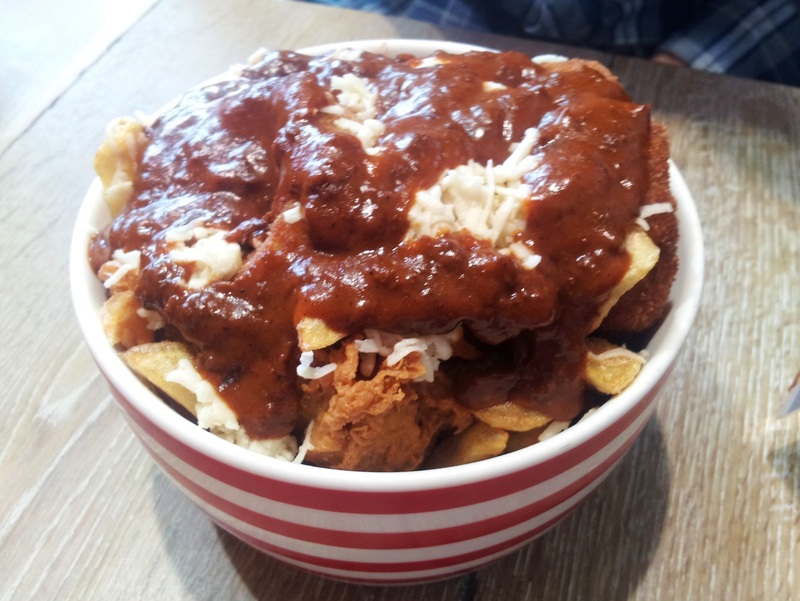 Next up, a trip to Lord of the Fries. Why oh why do I continue to go here and not enjoy myself? Perhaps that is a little harsh – it’s just that I have such high expectations! Vegans and omnivores alike, everybody tells me how great Lord of the Fries are..it makes me feel like I am missing something. Can somebody please explain to me why they are so good? Perhaps I make continually bad choices, I don’t know. Perhaps I need to visit at 3am after a night out – I bet I would enjoy it then. The bear and I got a few bowls of fried stuff. Here is some chips and chili poppers with vegan cheese and hot napoli sauce. Yet another sauce that really didn’t do much for me, although it was better than the satay and the special vegan mayo that I’ve tried before. The sauce wasn’t spicy at all, and the chili poppers were pretty tasteless – just friedness, with bland cream cheese style filling. Sorry for offending your eyes with this picture, I know it ain’t the prettiest. 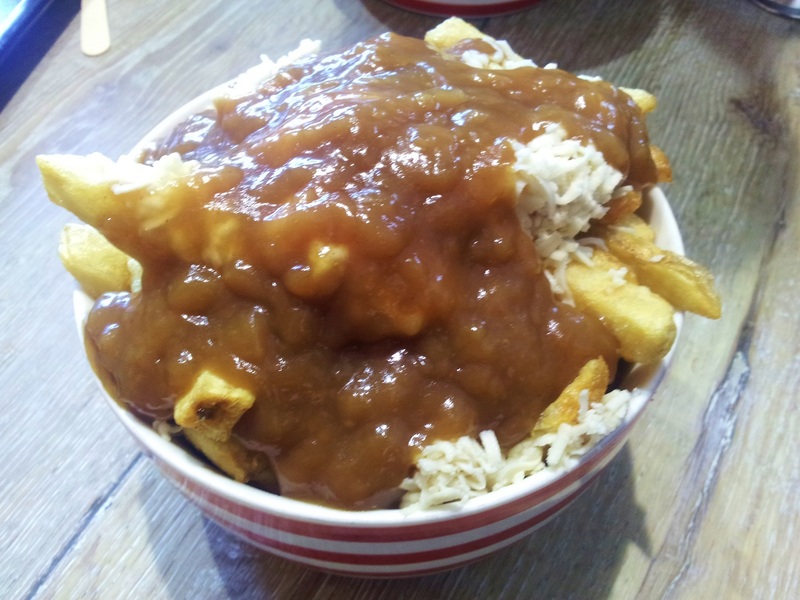 This is a bowl of chips and onion rings with vegan cheese and gravy. Admittedly, this was the best sauce of all the ones I’ve tried, despite its translucent gelatinous appearance. Not saying it was amazing, but definitely preferable to the others. Maybe I need to try the sweet potato fries. Or the burgers or hot dogs. I had a burger once and it was okay, but nothing mind blowing. No doubt I will be back some time, as I feel the need to crack this mystery. 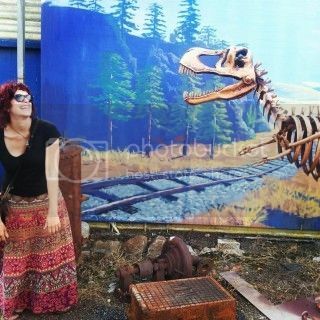 Oh my goodness – to think I almost let you get away without laying your eyes on this monstrosity! Okay, that was mean, I actually enjoyed this until I felt sick. The Chapel st store also does a few milkshakes, this one being Oreo flavoured. 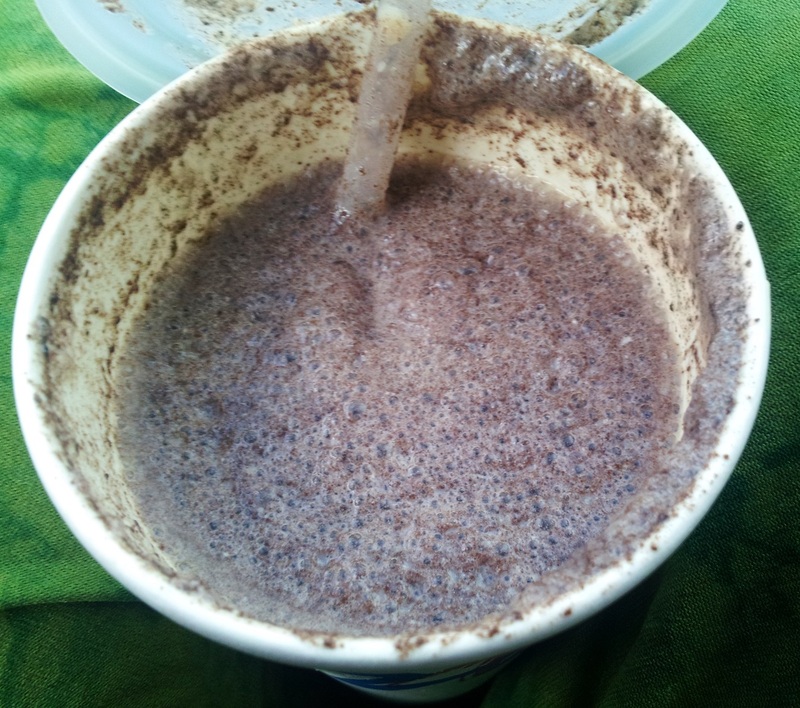 I know it looks a bit like sewerage, but it was not too bad – a bit sickly sweet, but hey, why else would you get a milkshake?